But At Which TV Taping Did It Take Place? Ole Anderson was interviewed by Wrestling Revue Magazine shortly after winning the Eastern Heavyweight Championship from Jerry Brisco in May 1973. The article mentions that Anderson won the title at a WRAL television taping in Raleigh NC, but does not list the date. There are two dates that evidence suggests might be the possible date of this title change: 5/9/73 and 5/23/73. Evidence supporting 5/9 as the date of the title change comes from a Richmond VA card five days earlier on 5/4/73, held at the State Fairgrounds at Strawberry Hill. 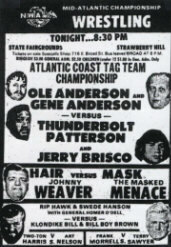 The main event was Ole and Gene Anderson defending their Atlantic Coast tag team titles against Eastern Champion Jerry Brisco and Thunderbolt Patterson. An original photograph taken in Richmond on 5/4 by photographer Bill Janosik shows Eastern Champion Jerry Brisco in the ring making a challenge to Ole Anderson. Brisco and partner Thunderbolt Patterson had failed earlier in the night to capture the Anderson Brother's Atlantic Coast Tag Team titles. An inscription on the back of this original photo by Janosik referenced a title change the following Wednesday 5/9, the date of Raleigh TV. 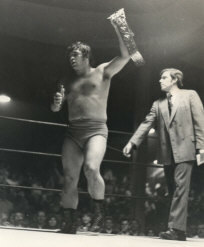 "This picture was taken on May 4, '73 and was the last time Jerry appeared in Richmond as the Eastern Heavyweight Champion. 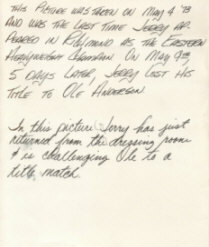 On May 9th, 5 days later, Jerry lost his title to Ole Anderson. In this picture, Jerry has just returned from the dressing room and is challenging Ole to a title match." Contradicting this evidence of a 5/9 title change is that Jerry Brisco is billed in newspaper ads as Eastern Champion later than that date in some newspaper clippings. Evidence supporting 5/23 as the date of the change comes from these scattered newspaper results. 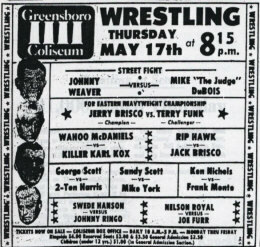 A clipping exists that promotes Brisco as defending the Eastern Heavyweight title against Terry Funk at a big card of wrestling on Thursday 5/17 at the Greensboro Coliseum. 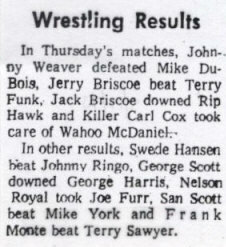 Advertising for house shows was occasionally prepared well in advance of the show date, and it's possible that the newspaper ad was not changed in time to reflect that Ole Anderson had won the title on 5/9. The result shown above does not mention the title at all, but that was sometimes the case in these newspaper results. 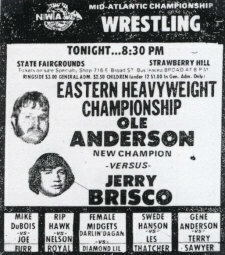 Another clipping exists from a card in Richmond VA two days later on Friday 5/25 at the State Fairgrounds that bills Ole Anderson as the new Eastern heavyweight champion defending against former champion Jerry Brisco. If the information alleged in the magazine interview mentioned earlier is correct about the title changing hands at a Wednesday WRAL TV taping, and if Brisco was indeed the defending champion in Greensboro on Thursday 5/17, the only possible taping between Greensboro and the 5/25 Richmond show where Ole was champion was Wednesday 5/23. Weighing all the evidence we currently have, I personally believe that 5/9/73 was the date of the change, as noted by photographer Bill Janosik on the back of Richmond photograph. Ole Anderson wrestled Jerry Brisco in Richmond a week after the photo was taken (and two days after the date alleged as the title change) on 5/11/73 at the State Fairgrounds. Neither man was billed as champion in the newspaper ad and the title was not mentioned in the result. Janosik would have been at that show (he photographed all the Richmond shows during this time period) and would have determined that Anderson was the new champion and would have learned that night that Ole won it two nights earlier at the WRAL TV taping in Raleigh. It would explain his definitive declaration on the back of the photograph. I would further suggest that the Greensboro match originally billed as an Eastern title defense by Brisco wound up being a standard match with no title at stake following Brisco's loss to Anderson at TV on 5/9. Furthermore, on each of the Wednesday nights that TV tapings were held in Raleigh that fell between 5/9 (the night Brisco as champion challenged Anderson in Richmond) and 5/25 (the night Anderson defended the title against Brisco in Richmond), there was a house show at the City Auditorium in Asheville NC. Neither Jerry Brisco nor Ole Anderson appeared at any of these three shows (5/9, 5/16, and 5/23), which would have allowed them to appear on the TV tapings each of those three weeks. We welcome further information that would further confirm or contradict 5/9/73 as the date Ole Anderson won the Eastern Heavyweight Championship. Jerry Brisco photograph by Bill Janosik. Newspaper clippings from the collection of Mark Eastridge. This article was posted and last updated on 8/16/06.